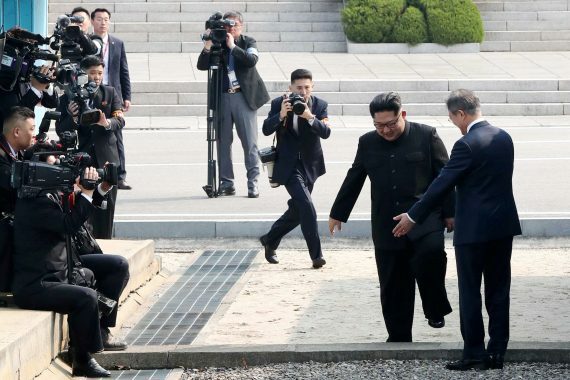 Many amazing sights unfolded at last week’s Inter-Korean Summit in Panmunjon, but one that struck me was the North and South Korean journalists that were running back and forth across the military demarcation line without hinderance. At any other time that kind of thing would be impossible, but journalists from both countries were given unprecedented access to Panmunjon for the summit. The North Korean reporters could be easily identified by the red or blue “press” arm bands they all wore, the Kim Il Sung and Kim Jong Il badges worn on their lapels and, in some cases, by their haircuts. 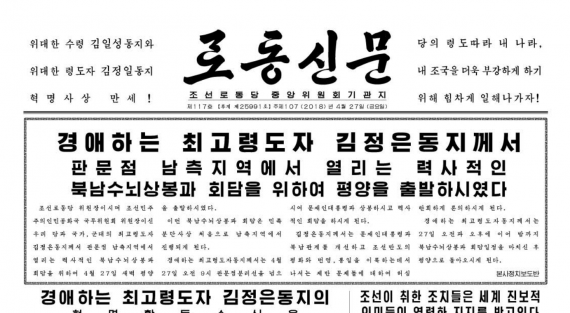 North Koreans woke up to news of the summit on the front page of the Rodong Sinmun newspaper [PDF]. A top story noted that Kim Jong Un had departed for Panmunjon to meet Moon Jae-in. The report was unusual in that it reported on an activity Kim Jong Un had not yet made. Typically, North Korean media only reports on the leader’s movements 1 to 2 days after they take place, so giving the domestic audience a preview was unusual. It was also a sign of confidence by the North Korean government that it would subsequently have something positive to report. The front page of the Rodong Sinmun newspaper on April 27, 2018. The same news was also broadcast on Korean Central Broadcasting Station, the main national radio station, but North Koreans hoping for updates throughout the day were to be disappointed. While TV networks in South Korea and around the world broadcast moments of the summit live, North Korean TV wasn’t even on the air. North Korea’s lack of a live broadcast isn’t particularly unusual. The TV station only broadcasts a handful of live events each year — usually parades in Pyongyang — and rarely comes on air early. In the past when it has done, it’s been to broadcast news of something that already happened, such as an early morning nuclear or rocket test. Here’s some video of what viewers in North Korea saw versus the rest of the world. 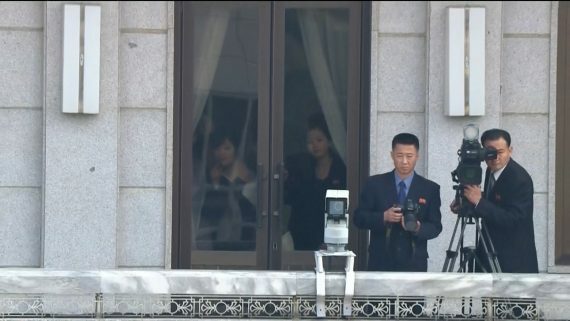 As I watched, I noticed a large number of North Korean journalists capturing still images and video. The question was: would these ever be presented for domestic consumption. North Korean media was present for the visit to Seoul of Kim Jong Nam and Kim Yo Jong, but that footage wasn’t broadcast in news bulletins, so what would happen this time? On Friday, KCTV began broadcasting as scheduled at 15:00 and ran the report on Kim Jong Un leaving for the summit. The report mirrored the morning newspaper and radio stories and wasn’t repeated during the day. It comprised the only reference to the summit made all day and included no still or video images of Kim leaving. 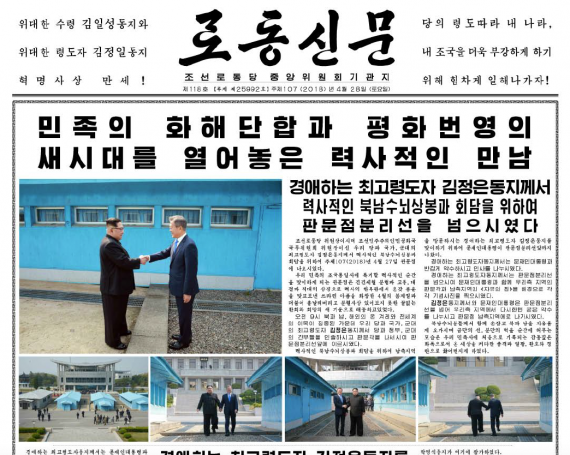 The real summit news came on Saturday, when the Rodong Sinmun newspaper led with four pages of summit news [PDF]. The reporting was significant for the amount of space given over to the news and that it made completely clear that Kim Jong Un crossed the border and held talks in South Korea. There were even pictures on the front page of the two leaders making their steps across the border. Later in the day, KCTV opened with a 26-minute report on the happenings at Panmunjon broadcast at 15:09. The report, titled “민족의 화해단합과 평화번영의 새시대를 열어놓은 력사적인 만남 조선반도의 평화와 번영, 통일을 위한 판문점 선언” included the full text of the Panmunjon agreement read out by Ri Chun Hee. That emphasized the importance of the agreement as Ri is only used for the most important news. It was supplemented with a second edit of the report that included video from the summit. The video appears to be solely or largely based on footage from North Korean cameras and begins with Kim Jong Un speeding towards the DMZ. Included is video of a new road gate, apparently installed after a defection last year. That report aired at 17:00, 20:00 and 21:37 occupying the main broadcast news slots of the day. The report was repeated on Sunday also, opening programming at 09:21 and playing again at 15:00, 18:38 and 20:31. Also on Sunday, North Korean media reported on how the summit was major news around the world. In a story on the front page of the Rodong Sinmun, media from China, Russia, Iran, Nepal were mentioned in that order. The report then went on to name-drop Japan’s NHK, UPI, CNN, and the BBC. On Monday, KCTV again broadcast the news and supplemented it with a longer documentary-style report on the summit, which consisted solely of video from the summit and was accompanied by a narrator and music. The program, “<조선기록영화> 민족의 화해단합과 평화번영의 새 시대를 열어놓은 력사적인 만남 경애하는 최고령도자 김정은동지께서 문재인대통령과 상봉 – 주체107(2018).4.27 -,” was broadcast three times at 15:51, 20:41 and 22:20 and is likely to be repeated further. The summit has been given major play in North Korean state media. The special reports and documentaries underline the importance of this to the regime and some of the images shown have no doubt been surprisingly to domestic viewers, but so far the coverage has more or less followed the typical playbook for big news. Outside of the summit, everything is continuing as normal. The breaks between TV programs are filled with the normal propaganda songs focused on Kim Jong Un and the military and the rest of news continues its typical diet of social news, visits by foreigners, scientific developments and sports. It will be interesting to see if there is any discernible change in media output in the coming weeks and months.